Wembley has cost nearly £800 million to build. This weekend the new Wembley Stadium will host its first full capacity event as Manchester United and Chelsea clash in the FA Cup Final. But to get there, there's an awful lot that's gone on first. The technology needs of the new stadium are varied. Under the four acre moveable roof section and the 133 metre-high arch is one of the most technologically advanced stadia in the world. For example, there will be 35 miles of heavy-duty power cables running through the stadium. These will cater not only for general needs but also for the huge amount of power needed to broadcast the stadium's events around the globe. Two giant widescreens bookend the new stadium - each the size of 600 domestic television sets. Screens in football stadia have come a long way since a Sony Jumbotron was installed at White Hart Lane in 1995. Microsoft is a founding partner of the new £798 million arena. It'll be involved for at least the next four years providing software and systems. For its £5 million, the software giant will also get its name above the entrance and 100 billboards around the ground. The company gets exclusive use of the stadium for one day a year until 2010 as well. Bit of a shame Vista 's UK launch was before the stadium was handed over to the FA in March then. 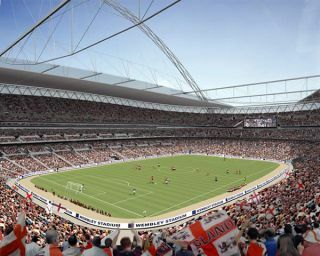 The FA's stadium operator, Wembley National Stadium Limited (WNSL), says that the stadium is expected to have over two million visitors per year. "Wembley Stadium plays a unique role in British life - it's a national icon that has inspired generation after generation of young people with the dream of playing and performing at Wembley," says Microsoft's UK marketing officer Nick Barley. The new stadium also has an 'official supplier' deal with npower . It'll be the first UK sporting venue to be powered using renewable energy. And then there's the broadcast of the Cup Final itself. As well as the usual BBC1 and Sky Sports showings, both Sky Sports HD and BBC HD will be carrying the Cup Final in high definition. But the BBC will be providing the pictures as the host broadcaster. "High definition is growing, but so far it's seized the nation's imagination a bit less than some pundits expected. The BBC's first full HD broadcast was the World Cup 2006, and there's a handful of HD channels available on the Sky platform and cable," muses the BBC's director of sport Roger Mosey. "In the UK we're in a position where most people who have it love it - but it's some way from being a mainstream proposition." The scale of the structure is incredible. With a span of 315 metres, the arch will be the longest single span structure in the world. Whereas the old Twin Towers were 35 metres tall, the new roof is 52 metres above the pitch. It has a massively bigger footprint too - 103,000 square metres compared to 40,500m square metres. The fixtures and fittings have also demanded much attention. London Bridge-based industrial design firm Curventa Designworks created touchscreen information terminals for the new stadium. They're designed to promote the 10-year Club Wembley seat packages and other information about the venue. For visually impaired supporters, the new stadium will boast major technological advantages such as a radio system to transmit commentary to all parts of the ground. One of the key challenges for the new stadium was actually nothing to do with technology at all: grass. Wembley is all about the pitch. And the major problem was keeping it as green as the national stadium's pitch should be. The pitches at many club grounds - notably Old Trafford and Stamford Bridge - have suffered as stands have been built ever higher. And increasingly large swathes of grass remain in near-permanent shadow.